1. 03/31/98 16:00:00 GMT - email from AT&T notifying customers of the change (switch) in the Worldnet Price Plan. 2. 05/28/98 7:37:58PM ? - email from AT&T notifying "me" that my usage was now "...available for viewing online!" and starting "tomorrow" - with the start of my next billing cycle, I would now be subject to the $0.99/Hr surcharge for hours used in excess of 150 Hrs/Mo. 3. 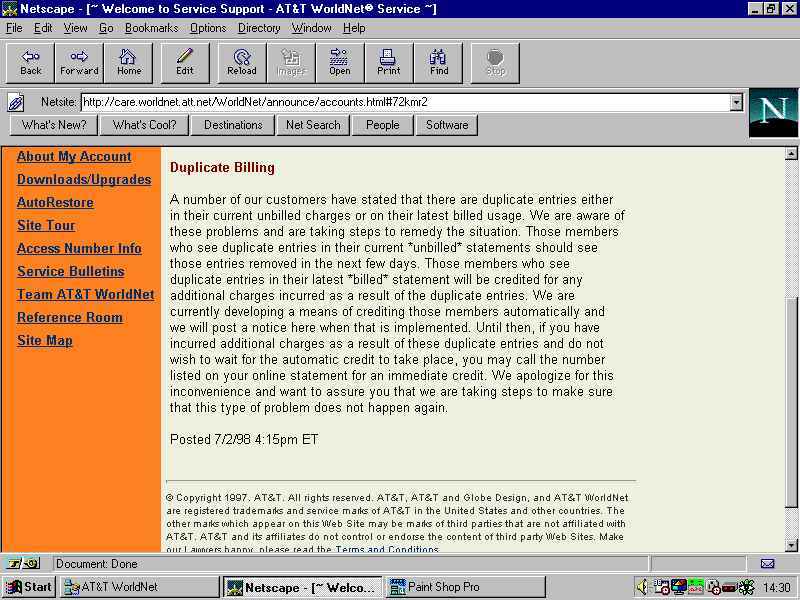 06/24/98 - FINALLY - "One Click" access info to our "Usage Logs"
email from AT&T notifying customers of the change (switch) in the Worldnet Price Plan. To: "All AT&T Worldnet Unlimited Price Plan Members"
We want to let you know about some important news that should significantly improve service access and reliability. Beginning May 1, 1998 the terms and name of the $19.95 Unlimited Price Plan are changing. It will be called the Standard Price Plan which offers 150 hours of AT&T WorldNet(R) Service usage for $19.95 per month, with additional hours billed at $0.99 per hour. We thought long and hard before moving to the Standard Price Plan, but found that most of our members use the service an average of 25 hours per month, while other members use the service a great deal more than that. Based on this, we've decided to revise our current usage plans to enhance service to all of our members, resulting in improved connections on the first try. Charges for usage in excess of 150 hours per month for any member on the Standard Price Plan will be waived by AT&T WorldNet Service until your usage is available for viewing online. On May 1, some affected members on the Standard Price Plan will be able to begin viewing their usage online. However, all members will be notified via email when their usage becomes available for viewing online. For more information about these changes, please visit these Web sites: http://www.worldnet.att.net/care/accounts/capfaqs.html to get all your questions answered. http://www.worldnet.att.net/care/teamattwn/coachescorner/newletter.html for an important letter from the President of AT&T WorldNet Service outlining service changes and improvements. Responses to this message will be directed to the two sites listed above where you will find the answers to your questions. Thank you for your understanding and continued support of AT&T WorldNet Service. As always, providing you with industry leading network performance and a superior online experience is critical to our business. Thank you for using AT&T WorldNet Service. It's all within your reach. email from AT&T notifying "me" that my usage was now "...available for viewing online!" On March 31, 1998 you received an e-mail message and a subsequent postcard from AT&T WorldNet® Service explaining changes that the Unlimited Price plan, the plan you are currently on, will undergo on May 1, 1998. The name of the "Unlimited Plan" will change to the "Standard Plan". The Standard Plan offers 150 hours of Internet access per month for $19.95 with additional hours above 150 billed at $0.99/hour. In both those communications it was explained that charges for usage in excess of 150 hours per month would be waived until your usage was available for viewing online. This message is to inform you that your AT&T WorldNet Service usage can now be seen and tracked by you online! Therefore, your next billing cycle, that begins tomorrow, will be subject to the $.99/hour charge for all hours above 150 in a month. Responses to this message will be directed to the site listed above where you will find answers to your questions. 06/24/98 - FINALLY - "One Click" access info to our "Usage Logs"
Subject: How to get time info in one click ... was ---- Re: Unilateral pricing changes. This is the most "useful" piece of information put out since this sorry state of affairs was announced. In any case, thank you Karla for this valuable time saving tip. There is a quick way to access your Usage Information and Monthly Statements. In order to do this, you will need to create a bookmark that contains various account information. Since you are creating a bookmark, this means anyone that has access to your computer could get to and change your account information, including canceling your account. So do NOT do this if you are concerned about security. First, go to http://acct-update.worldnet.att.net/cgi-bin/admauth_dbd and enter your email id and email password into the form provided. Click the submit button and wait for the next page to be displayed. Now go edit your bookmarks and add a new bookmark called 'Online Usage" and for the URL, insert the above string. If you want to use the SSL security protocol, then change the http to https. Now you are just one click away from viewing your Online Usage! Works like a champ and no multitude of web pages to work thru! Not only do you change the pricing policy without any input from your customers, you make it easier to go to Katmandu than to try to find out how many hours you have left in a billing cycle before you start charging additional outrageous rates which was not the program I signed up for. At least when I come onto the Internet, let me know how many hours I have spent on the internet in this pay cycle and the amount of hours left and the end of the pay cycle so that I have an idea when you start running the meter and how much outrageous new charges I will incur, otherwise I'll have to keep a log here to approximate the amount of usage and hope that you agree with it. What is all this jumping through hoops for to find out how much additional money you are going to charge me from my original agreement? Do you have people on the payroll that just try to think up ways to make it more difficult for your customers, or does this just come naturally? Looking for another provider every chance I get. Thanks for the misery. With my original sign-up date of 29 Sept 96, under the "$19.95/Mo - Unlimited Usage Price Plan", AT&T's NEW "$19.95/Mo Standard Price Plan" (Limited Use, 150 Hrs + additional hours at $0.99/Hr), was not imposed on my account until the start of my first month of service following May 1, 1998. The effective date of this NEW price plan subscription was therefore 29 May 98 - and my first month of service under the NEW price Plan was 00:00GMT 29 May 98 thru 24:00GMT 28 June 98. In addition to subscribing to a second - local - ISP, at additional cost, I was now "forced to" - and did closely monitor the usage of my AT&T Worldnet account. This first month would "allow" an average use of 150Hrs/31Days = 4.838 Hrs/Day. Because of AT&T's inability (or unwillingness) to allow their customers to see live, or at least "near live", usage data for their accounts and AT&T's 48 Hour or more "posting delay" of this data to the customers "Unbilled Usage Information Report", I did monitor this report closely to determine "average daily use" vs. the allowed average for this month. NOTE: Although not stated in the terms of this NEW "Standard Price Plan" there are - in fact - two separate "Standard Price Plans". I have only seen mention of this "fact" in AT&T's responce to questions about the "online timer" in the worldnet "newsgroups". 1. For customers who have not "been timed" by Worldnet as using greater than 130 Hours in a billing period, or calander month? - for which on-line tracking of login data is not available. 2. For customers who have "been timed" by Worldnet as using greater than 130 Hours in a billing period, or calander month? - are subsequently notified that they have been "put on the clock" - and that starting with their next billing cycle on-line tracking of login data is will be available (with the above noted restriction that the data is retrieved and "posted in arrears") and from that point forward - the start of the billing cycle following their exceeding 130 hours - they will be subject to a charge of $0.99/Hr for time logged in excess of 150 Hrs/Mo. Things were proceeding "ok" thru a report run at 09:29CDT 06/24/98, my 25th day of this billing cycle, which reported usage "effective as of 06/23/98" and a final login entry of 06/22/98 at 17:59GMT for 03:43 (3 hours - 43 minutes) - and a "Duration Total" for this period of 112:10 (112 Hours - 10 Minutes) - for an average daily useage of 4.486 Hrs/Day vs. 4.838 Hrs/Day "allowed". This all changed with the information furnished with an "unbilled Usage Information Report" run at 09:21CDT 06/26/98. Although not specifically identified in the AT&T correspondence quoted above, I did determine that this "newsgroup" and/or the "newsgroup" worldnet..members-forum was the "destination" for feedback, comments, or questions concerning the change in Price Plan, it's implementation schedule, the availability or non-availability for viewing of the customers usage log on-line by customers subscribed under this NEW "Standard Price Plan, and the accuracy or inaccuracy of these "on-line usage logs". Subject: Watch your AT&T Reported "Online Time" - was - Re: 150 hours, billing, I'm confused. ---------- Here's another "puzzeler" folks - I hope that I can also get some clarification from our "friends" at WorldNet. I may be called "fortunate" by some, and maybe in a way I am. I signed on with AT&T WorldNet Service under their flat rate $19.95/Mo "Unlimited Usage Plan" on 29 Sept 96. Therefore, AT&T did not unilaterialy terminate this plan and impose their reduced benefit, flat rate $19.95/Mo "150 Hour + $0.99/Hr" plan on my account until 29 May 98. My first billing under the NEW Price Plan will be for the period 00:00GMT 29 May 98 thru 24:00GMT 28 June 98. Since coming under this NEW PRICE PLAN I have been closely monitoring the usage recorded to this WorldNet account to keep it under the "allowed - flat rate limit" (150 Hours / 31 days = 4.838 Hrs/Day Avg). My last check on time, prior to today, was at 09:29 CDT on 06/24/98 when WorldNet reported my usage info "effective as of 06/23/98" as 112:10 (112 hours 10 minutes) with the final entry 06/22/98 - signed on 17:59GMT for 03:43. (25 days, avg 4.486 Hrs/day). I am retired, enjoy travel, have developed a rather extensive web site, including the hosting of "Rick & Linda's Travelin' Partners ICQ List", hosted by Tripod. At the time this site was started - despite "promises" - AT&T did not offer web site space. I am a "Charter Member" / Beta Tester for AT&T's offering of Personal Web Space. I do a lot of online communicating with friends worldwide, obtain most of my news - both "normal" headline and world news as well as computer and internet news -- online and subscribe to and monitor about a dozen "Internet Newsgroups" -- all of this has caused me to be one of the "notorious AT&T - 3%". I DO NOT APPOLOGIZE FOR THIS - THIS IS WHAT AT&T ADVERTISED, PROMOTED, AND I SIGNED UP FOR - UNLIMITED USAGE. I have not abused the service that I subscribed for by remaining "logged on" and not "actively using" the connection. I do, by the way now consider myself (and any other AT&T WorldNet customer who signed up for service under the "Unlimited Usage Plan") to be "injured" by AT&T's unilateral revisions to their Terms of Service and Price Plans. I have obtained a second "unlimited usage" account from a local ISP, at additional cost to me, to assure that I do not exceed AT&T's arbitrarily imposed usage limit. I also consider myself to be "injured" by WorldNet's online time monitoring utility. I was willing to give them the benefit of the doubt, but it appears to be not only not timely but also perhaps fraudulent. It's truely unfortunate that AT&T - this "leader" in the worlds communications industry - can provide no direct method of EMAILING their accounting group to "head off" a developing problem and can not provide users with a "true online - live - usage time tracking utility" now that they have SWITCHED their original customers and imposed this limited usage plan on us. I will probably spend HOURS on the phone (on hold - or trying to work my way thru the phone maze) today in an attempt to correct the time insertions and determine "just where" my usage does stand. Here's another "puzzeler" folks - I hope that I can also get some clarification from our "friends" at WorldNet. Now to todays news: Since coming under this NEW PRICE PLAN I have been closely monitoring the usage recorded to this WorldNet account to keep it under the "allowed - flat rate limit" (150 Hours / 31 days = 4.838 Hrs/Day Avg). My last check on time, prior to today, was at 09:29 CDT on 06/24/98 when WorldNet reported my usage info "effective as of 06/23/98" as 112:10 (112 hours 10 minutes) with the final entry 06/22/98 - signed on 17:59GMT for 03:43. (25 days, avg 4.486 Hrs/day). Note: The addition of one more "login" on 06/22 that was not reported by Worldnet on either the 09:29 6/24/98 report or the 09:21 06/26/98 report of "my unbilled usage data". ALSO this latest report still contains the INSERTED DUPLICATION of the five (5) entries noted above totaling 8 hours 56 minutes. I "suspect" that my corrected usage "effective as of 24:00GMT 06/25/98 is 132:47 - 8:56 = 123:51 (4.587 Hrs/Day of the 4.838 Hrs/day "allowed"). Although with Worldnet "adding" times after reports are issued "effective such and such a date" - I'm not sure. AT&T "Ken" did respond to a plea for help in providing a Worldnet Billing email address and this message is also directed there (wnetbill@attmail.com). Hopefully this "logging problem" will be resolved before it becomes billing fraud. AT&T "Ken" also provided a number, 1-800-400-1447 #2 (for Billing Problems) #0 (to speak with a live service representative). In 5 attempts, starting at 12:48 this date - I have yet to connect with a live service rep. This "posted in arrears" logging system - is a relic from the days of "green eye shades, shirt sleeve garters, and clerks slaving over manual ledgers". AT&T - come into the computer age and provide a real time usage logging system - YOU are the one that has CHANGED THE RULES - the least you can do is provide an accurate and reliable usage log. P.S. I have tried out a few of the third party online time tracking utilities recommended by "WURD" but have found them to be either unreliable (no log entry recorded when the system locks up and I have to shut down and cold reboot) or not consistant with AT&T Worldnet's time accounting methods of accounting and rounding to "minutes" - which, in itself, is absurd with computer clocks synchronized to the atomic clocks of the NBS and recording time to the hundredth of a second, at least mine is - every time I log on. After attempting to reach a "live" service representative 5 times this afternoon, only to be put in queue and advised that "a service representative should be available in "x" minutes - at 12:48CDT, 13:32CDT, 14:47CDT, 15:38CDT, and 16:22CDT, I finally connected with a live service rep on the 6th call - started at 17:46CDT. By this time I was "a bit irked" and had placed the call thru the telephone application of my "Aptiva Communication Center", and after hearing all afternoon that "this call may be monitored for quality purposes" - had turned recording on. The service reps name was garbled and illegible as he answeared the call - but I identified myself and advised him that the call was being recorded "for quality purposes". He propmptly advised that he could not accept a call which was being recorded and I said "ok I'll turn it off" - however he had already hung up. I then placed a 7th call - starting at 17:52, waited thru the queue, and finally connected with an AT&T Worldnet service representative named "Mike". After the identification process: - the phone number that the account was associated with - I have two and identified both - one was "recognized". - my "security word" - which i thought was that long convoluted signon password and dug it out of my records only to be told that was not what he "needed" and my email password was not "it" either he needed the "security word" --- but relented and asked if I could give the last 5 numbers of the credit card under which the account is billed. - Mike was a little helpful here - at least he identified which credit card and i gave him the "last 5 numbers" which was "ok" he then asked again for my "security word" saying "give me anything that comes to mind that might be it - and we'll see if anything matches"
- I gave him my email password - which lo and behold - in my case just happened to match with my "security word". After all of this ID process, (I'll know next time - if there is a "next time"), which took 6 to 8 minutes digging thru records and running to get my wallet etc. we finally got down to business. And I recounted to "Mike" what I had found in reviewing the "Unbilled - Usage Information Report(s) run at 09:29 06/24/98, 09:21 06/26/98, and 15:39 06/26/98. i.e. 1. The appearance of an additional "login" on the 22nd - reported on the third report which was not included on either of the prior "reports" - despite the fact they indicated they were "effective as of 06/23" and "effective as of 06/25" with the third also indicating it was "effective as of 06/25/98"
"Mike" then advised that "he had never seen this" and that he'd have to discuss this with "his supervisor". I said - let ME talk with "your supervisor" .... but he was gone. 2. If this "situation" occurs again, "Paul's" recomendation would be to close my existing account (which I've had since 09/29/96 and have hundreds of correspondents that know my current email address) and open a new account. Is this a fine way to run a "world class" service - or what? You're welcome. From some other - similar - posts I don't think that these are isolated cases. I have an uneasy feeling, based on the review of my records, that for some reason between about the 24th and 26th the logging system failed, and two days "usage" was "dummied up" ... i.e. the duplicate postings were entered in order to be similar to the usage pattern thus far in the "billing month". My time average for "my" 25 day period (5/29 thru 6/22) was 4.486 Hrs/day x2 = 8.872Hrs .. the duplicated time = 8:56 = 8.933Hrs. Either - when the true login records were retrieved and input (or perhaps some more creative login accounting "records" were entered, there was a failure to remove the duplicates. I just ran a "final"? Usage report for the end? of my billing period and the duplications are still included - despite Worldnet being notified - in this group, via phone, and via email (with no responces by the way either in the group or by email). Looks like 3%'ers are still in for some more corporate harrassment.